At Waterloo, although, in a sense, I was present, I was unable to fight, and the enemy was victorious. It is not for me to say that there is a connection between these two things. You know me too well, my friends, to imagine that I would make such a claim. But it gives matter for thought, and some have drawn flattering conclusions from it. Thus does our old friend Etienne Gerard begin his penultimate tale of adventure, reminiscing convivially about that horrible day at Waterloo. His characteristic reserve and modesty are obviously on full display, for is not humility one of the greatest traits of this very great man? Not on your life…and we wouldn’t have it any other way. I was once again struck by the ways in which Gerard is so similar in character to Harry Paget Flashman, and yet also so diametrically opposed to him. 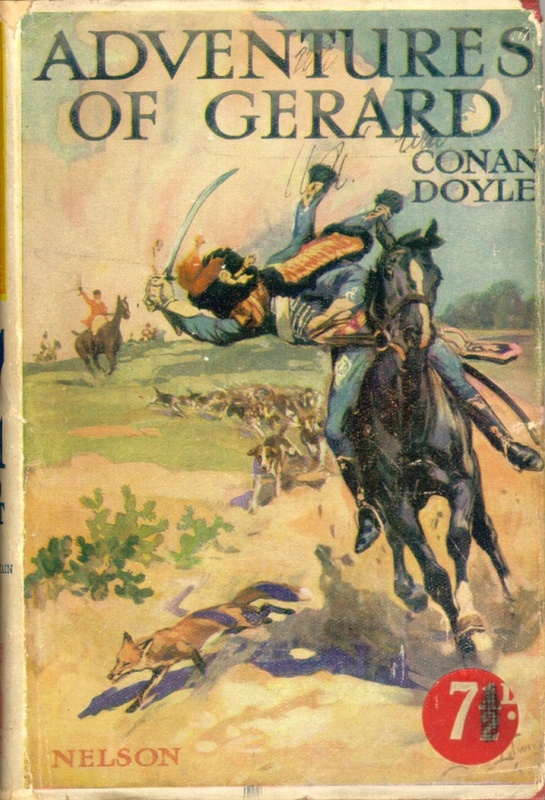 Where Flashy blunders treacherously from misadventure to misadventure in a cowardly attempt to escape danger while still managing to cover himself in glory and praise, Gerard nobly blunders from misadventure to misadventure in a valiant attempt to singlehandedly win every battle in the Napoleonic wars and manages to escape with his life despite his foolhardiness and obtuseness. Some glory adheres to him, but it’s unclear how much is truly universal in its acclaim and how much is only in his own mind. Of course, there’s usually a woman involved as well. And she is always smitten to the core by our brave and dashing hussar. Who wouldn’t be? Conan Doyle certainly seems to have had a knack for creating memorable, even great, characters. Sherlock Holmes is of course an icon, a literary giant that has stood the test of time. I hope that Gerard does as well, for while he is certainly less well-known than his consulting detective confrere, he is no less intriguing a character. As with Holmes it is due mostly to his faults that Gerard ought to win a place in your hearts and minds. A bigger braggart and narcissist could little be imagined (Harry Paget Flashman notwithstanding), and yet he is a lovable egoist for all of that. Gerard’s heart is always in the right place and if he happens to believe that everyone (even his enemies) truly love him, is he really, perhaps, all that wrong? He is, certainly, an eminently likable old fellow. This is sadly the last volume of Gerard’s adventures and it runs the gamut of chivalrous exploits undertaken in the name of a lady, to affairs of honour (in the name of a lady), and let’s not forget the martial exploits in the name of the Emperor which of course override all other concerns (though sometimes a lady *is* involved). It’s a pleasure to listen as the Brigadier recalls his days of glory and for all of their inherent humour (usually indiscernable to Gerard) there is also some pathos evoked by them, for it is apparent that this jovial old grognard living on half-pay and memories alone has nothing else save the planting of cabbages with which to while away his final days, for he remained loyal to his beloved emperor and his own prospects and standing faded away as the star of Napoleon itself dimmed and disappeared. This last was certainly not without some attempts by Gerard to undo the wrong done to his master, but that’s a tale you will have to hear for yourself. I urge you to do so, the Brigadier is always a genial companion. Ah, by the bye you don’t mind springing for a bottle of burgundy, do you? There’s a good fellow.